Double-ended, angled shaft, 8mm from bend to tip, 1.5mm flat spatula, curved 6mm teardrop-shaped spoon with three long openings. Flat handle. 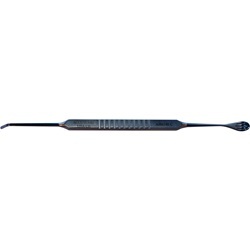 Overall length: 140mm.